A gleam in Bob Packard's eye, this climbing-based road trip to Baja California had been contemplated for quite some time. The emphasis would be on nabbing the peninsula's most prominent summits. I would tag along for both my Spanish and because Bob had to pass through my home town, San Diego, enroute to Baja anyways. Edward Earl, also of San Diego, had a keen interest in this trip, having longed for a climbing trip down the full length of Baja for several years. Unfortunately Edward has used up all of his vacation time on a recent expedition to Venezuela with Bob and myself. Seeking an alternative member, Andy Martin came to mind. Bob approved of Andy's attendance and we were set for a prominence-based adventure in old Mexico. Bob and I had previously climbed the most prominent (and highest) summit of Baja on separate occassions. Therefore, Picacho del Diablo of Baja Norte would not be on our itinerary. Bob was constrained by obligations in his home town of Flagstaff, Arizona to a road trip commencing March 10 and ending March 23. This time window determined how many summits we could attempt, factoring-in driving time and other considerations. The original plan called for climbing the second through fifth most prominent summits of Baja California. For completeness the following table includes Picacho del Diablo. 1Values in parentheses are uncertainties in feet. 66, 98 and 131 feet correspond respectively to 20, 30, and 40 meters on the metric topographic maps. In summary, all three of us climbed the two most prominent summits in our plans - with the bonus of the Sierra La Laguna highpoint being the Baja Sur state highpoint. 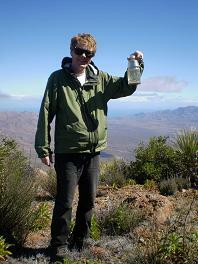 Bob alone succeeded on Cerro La Sandia, the fourth most prominent in Baja. Our climb of Sandia on March 13, including the reason why I turned back short, is described below. There was precious little time to climb the Sierra La Giganta highpoint, fifth most prominent in Baja. In compensation we all secured several unanticipated summits, albeit with minor prominences, as described in the relevant sections. Note 1: Click on any photograph for a larger version. Note 2: All GPS coordinates use the NAD27 datum. Bob Packard departed Flagstaff, Arizona and camped off Exit 236 on I-17 a little north of Phoenix. This set him up for an early morning meeting with Andy Martin at Gila Bend. After his wife delivered Andy to Gila Bend, Bob and Andy drove to San Diego to retrieve Adam at his home in Del Mar. They depart for Mexico around noon, and find an isolated beach-site camp under the setting sun. The dirt beach access road is some two miles long, and begins at highway 1 exactly 3.1 miles south of Camalú. Our camp GPS coordinates: zone 11R (590511 E, 3406546 N), elevation 42 feet. Seating was tight with three people in Bob's cab. Andy and I traded-off time sitting in the center as Bob drove. It was uncomfortable because on the far right I would have to sit higher than the natural seat depression. When in the middle I had to sit at an angle, legs in the right passenger well to avoid the gear shifting mechanism at truck center. Presumably Andy had less difficulty because of our relative sizes: being much larger than myself, Andy's center of gravity had to shift less from a "comfortable" seating position. After several days I became so unhappy with the situation that I would lie down in the camper as Bob or Andy drove. I could not share the driving because I never learned a stick shift, an outmoded and increasingly rare type of automotive transmission. Our first mountain was Sandia, and the entire day was spent driving to a nearly deserted ranch for a northeast approach. The final dirt road leading south to our campsite was about twenty miles long and took 2 hours 15 minutes to traverse. The first six miles off the pavement were the worst, consuming a full hour and requiring both high clearance and four wheel drive. Our camp GPS coordinates: zone 12R (265658 E, 3151757 N), elevation 848 feet. Highway 1 is the main, and virtually only, paved highway on the Baja peninsula. Stretching from Tijuana in the north to Cabo San Lucas at the southern tip, it is not of the quality one expects of major highways in North America. There are just two lanes, i.e. one in each direction, and the shoulders are nonexistent. Mexican drivers take greater risks when passing than Americans are wont to try, and the resulting combination is both unsettling and dangerous. The worst feature is that often the entire roadbed is inexplicably raised several feet above the desert floor. Thus getting pushed off the pavement (which is quite easily accomplished with a passing truck) can readily lead to vehicle rollover and severe injury. Bob generally maintained 50 miles per hour while on highway 1, as going any faster was simply unsafe. are center stage in this photo. In light of the above considerations, driving the full length of Baja and returning the same way (since only highway 1 runs the full length), can be a somewhat monotonous and boring experience. As a saving grace, the mix of xeric (dry-adapted) succulent flora varies with each region of the peninsula. Boojum forests are especially interesting, as are the huge cardon cacti that put saguaro to shame. Bob Packard and Andy Martin have done a lot of hiking and climbing in the more arid stretches of the desert southwest. They both have experienced running out of water on hot days without ill effect. I am not so fortunate. Getting behind on my water balance by just a pint will cause headache and possible loss of coordination while atop rocks and boulders. After four hours of hiking it was still just nine a.m. Yet I had depleted fully one-half of my four quart water supply, and this after only one-half of the distance to the summit of Sandia, and just one-third of the elevation gain. A quick calculation indicated that I would run out of water at the summit, none remaining for an eight-hour return bushwhack, half in the dark, to our starting point. So I bailed out, giving one quart to Andy and a very large orange to Bob. Bob eventually drank the quart, while Bob and Andy split the orange. I returned cross-country in about 3 1/2 hours, traversing both dry washes and negotiating steep, crumbly rock on occassion to get out of them and see the terrain. Had I fallen and merely sprained an ankle, the vultures overhead would find me before any person might. It was risky business, this solo return thirty miles from any person but Andy and Bob, in a country without the facility for rescue. I both slept and ate my summit lunch inside the camper. Around two o'clock a Mexican sauntered by on horseback. He was the local rancher. 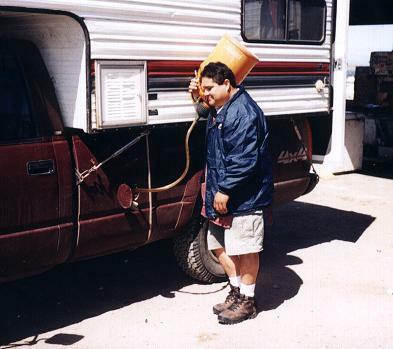 I explained Bob and Andy's intentions, and he laughed aloud when I told him that they each had taken only three liters of water. Soon it became apparent that this man was the sole hope for rescue should Bob and/or Andy get in trouble with their water level. At sunset the rancher returned from chores and I shared tequila with him in an attempt to make friends. His eyes became heavy and, after a refill, headed sleepily back the fifty yards to his outdoors bed near a disheveled shack he might have called home. I ate supper and slept until eleven p.m. when Bob and Andy knocked. After eighteen hours they had returned, sore and exhausted. Bob had made the summit, finding some partly illegible register in a tube. Andy waited at a saddle some thousand feet lower. He amused himself by cutting into a barrel cactus and extracting cactus pulp laden with water. It was nauseating to the taste yet provided perhaps a pint of needed fluid. It is clear to us that a preferred approach should exist from the south. Barring that, our route should be negotiated as a two day affair, one night spent in the backcountry. I cannot justify pressing onwards to the summit with full knowledge that dehydration is imminent. Perhaps Bob and Andy are made of stronger stuff than I. Certainly my slight build does not allow for a internal "reserve" supply of fluid as is likely found in a larger individual. I had learned from the rancher than a connecting road leading east was in even worse condition. So we returned north on the original dirt road, consuming two hours. We drove back through Bahia de Los Angeles and then headed west to highway 1 on our continued trek south. in Bahia de Los Angeles. Tres Virgenes was spotted from the northwest as we approached along the highway. A trip report in-hand included a photograph showing a dirt road leading towards the mountain from the west side. We stopped at a nearby family-run motel, the mountain in plain view a few miles north, and inquired as to how to access the desired road. 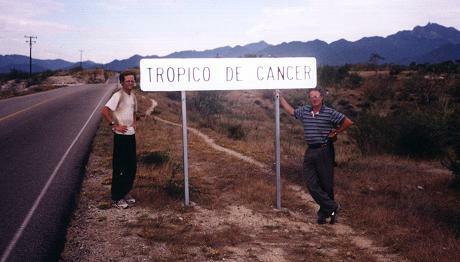 They insisted that no such western approach road to Tres Virgenes existed, despite showing them the photograph proving its existence. We gave up on these map-challenged people and found the dirt approach road on our own. It leaves the main highway at GPS coordinates zone 12R (335512 E, 3030735 N), elevation 919 feet, and initially heads perpendicular to the main highway in a northerly direction. The road turns northeast, and east, and eventually climbs to a saddle on the northwest slopes of Tres Virgenes. Here we made camp at GPS coordinates zone 12R (339544, 3041591 N), elevation 2,032 feet. The mountain was strikingly isolated, appearing magnificently large as befits a mountain of more than five thousand feet of prominence. We started up the northwest ridge of Tres Virgenes at 4:59 a.m. by headlamp. We made slow progress as cholla cactus was an extreme problem. The brush lightened up after perhaps two hours and a thousand vertical feet. Andy left two one-quart water caches along the route. The first is at GPS coordinates zone 12R (341534 E, 3040330 N), elevation 4,295 feet. The second is located immediately under a 300 foot steep section encountered upon "topping out" on the northwest ridge at GPS coordinates zone 12R (342531 E, 3040139 N), elevation 5,546 feet. The final effort was along a series of false summits with some class 3 sections interspersed with terrible bushwhacking. While atop the true summit one had a feeling not unlike that from a high-flying airplane. Five thousand feet of prominence was responsible. As no summit register was found, Andy left a sheet of paper. A descent via the west face looked promising since it would avoid the bad brush and also the dicey rock climbing immediately near the summit. We discussed this option at length, particularly as Andy would lose his water bottles on descending an alternate route. The downhill effort was quite boring, interrupted by the shouts of Bob as he was attacked by a swarm of bees. Andy and I thought he had broken a leg or something. Bob was absolutely terrified - I could tell by the look on his face. My mild case of heat exhaustion was relieved by the adrenalin rush of the bee incident, a problem likely engendered by our direction of travel straight into the afternoon sun. 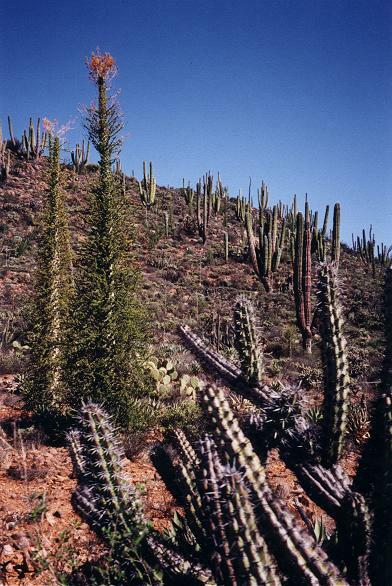 I felt relieved only upon entering the shade of a large boojum or cactus. We eventually dropped into a wash on the desert floor. Andy quickly hiked down the wash and then up the approach road to get Bob's camper. Bob and I met Andy where the wash meets the road, GPS coordinates (338740 E, 3040324 N), elevation 1,813 feet, having completed the climb at 4:38 p.m. some 11 1/2 hours after our start. Including pre-hydration during breakfast, I had consumed six quarts of water. We drove east and south for perhaps one hour, eventually making camp at a pullout one-half mile along the road leading to a microwave relay station. In Baja the microwave stations are labeled on maps and have road signs announcing their presence. Their cobblestone approach roads are a convenient, zero cost means of sleeping while traveling in Baja. We awoke before sunrise and drove up the approach road to the summit microwave towers. Upon reaching the top we were dismayed to find slighly higher ground one-third mile west. The short hike was done in tennis shoes. This summit, Cerro San Lucas, has an elevation of 580-600 meters and 220-260 meters of prominence. As such it is a "Colorado-rule summit", i.e. one with at least 300 feet of prominence. We found La Paz to be a sizable community. At the C.C.C. supermarket I purchased and then enjoyed a well-earned pint of ice cream. Bob and Andy stocked-up on provisions for the remainder of our trip. We continued our push south, eventually camping atop a second summit with microwave towers. After supper I went around with Bob and Andy, and by headlamp topped-out on all of three rock outcrops that could possibly be the exact highpoint of this, Cerro La Campaña (740-760 meters), also with 220-260 meters of prominence. We awoke to find a higher hilltop a quarter mile northeast that had been invisible to us at night. All three hiked the distance, a use trail making the effort more enjoyable than a pure bushwhack. Cerro La Campaña is also a Colorado-rule summit. We continued driving south, passing through Cabo San Lucas in search of the southernmost tip to the entire peninsula. A hill rose prominently from the beach, a most obvious summit that Edward Earl had climbed while on a trip here in 1991 for a total solar eclipse. Alas, the hill was now private property. 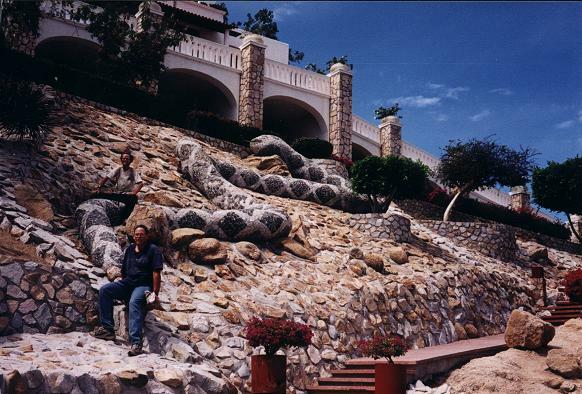 We drove into a nearby fancy residential community and climbed atop the highest hill south of Cabos San Lucas proper - Cerro Prieto with an elevation of 240-260 meters (787-853 feet). It was higher than Edward's hill, and had more prominence, 180-220 meters, easily being a Colorado-rule summit. Our GPS units indicated perhaps 840 feet elevation. It was annoyingly hot, sweat pouring with the slighest physical activity. We now could only drive north. Todos Santos is the community that serves as staging point for adventures into the Sierra La Laguna. We consulted a tour agency in a failed effort to secure a horse for the three-day backpack into the Sierra. I had diarrhoea, a sense of malaise, and general weakness. All I wanted to do was sleep. Clearly I had some stomach virus, or worse. I enjoyed a quesadilla and grapefruit soda from an outdoor food stall as mid-afternoon snack in the effort to improve my strength. By late afternoon I had decided to forego the climb of the Sierra La Laguna highpoint, a shame since it was the overwhelmingly most important venue of the entire journey. I considered simply taking a motel room for three nights, yet balked at the $25/night minimum price. The approach road from Todos Santos into the Sierra begins from highway 1 just south of kilometer 54, and about two miles south of town. It is good dirt and the 12.4 mile distance (the odometer being zeroed at the main highway) was driven in forty-five minutes. This brought us to a locked gate at GPS coordinates zone 12Q (595402 E, 2598644 N), elevation 1,865 feet. I ate a little for supper and fell asleep immediately. Andy had set his alarm for 3 a.m. in anticipation of a 4:00 a.m. departure - the early time, as with the entire trip, to avoid climbing during the very hottest hours. Somehow I managed to wake up around then. Checking my watch, 3:08 a.m. I was not drowsy. Acting quickly, I walked outdoors and, as if by magic, I felt good-to-go! I efficiently filled my overnight pack with all relevant materials. We headed east, past the gate and downhill along the dirt road, at 4:33 a.m. The path descended perhaps 100-150 feet before leveling-out. Dawn came around 5 a.m. - which was really 6 a.m. since our watches were set to Pacific time and yet we were in the Mountain time zone. Posted signs make the route easy to follow. Just follow them as they read to "Sierra La Laguna". A stream was encountered just past La Burrera - a deserted spot on the map that for some reason has come to receive this name. Leave the road (which has blended into the stream bed) and follow the sign to Sierra La Laguna up a trail to the left (north). The trail zigzags slowly uphill past some water sources, climbing from about 500 meters (1,650 feet) to perhaps 900 meters (3,000 feet), then descends about 200-300 feet to a major stream at about 850 meters (2,800 feet). Fill up on water here. The steepest part of the climb ensues, leading to 1,400 meters (4,600 feet) via a narrow path which often is surrounded by high walls (up to six feet) of decomposed granite. The gradient is never steep in absolute terms, only relative to how trails are constructed in the United States. Mexican trails seem to just go "straight up" rather than meander about. Its quite doable - the only difficulty being the relentless sun should you go, as we did, too late in the season. It is noteworthy how one of the hardest rocks, granite, readily decomposes into sand, while volcanic material often remains rocky. Granite is composed of small quartz and feldspar grains that separate at the grain boundaries after weathering. Volcanic rock often cools so rapidly that minerals never have time to separate, so creating rock of uniform composition and less subject to rapid weathering. Encounter a saddle at 4,600 feet with a sign, "Zona Nucleo", that indicates entry into the most ecologically sensitive area of the Reserva Biosfera Sierra La Laguna. In principle a one dollar pass is required to camp in the Sierra, obtainable from an office in La Paz. Unfortunately it takes 24 hours to obtain a receipt, then presentable to Park rangers in their cabin located in the now dry bed of former Lago Laguna at 1,720 meters (5,600 feet). Do not worry - the Park rangers also understand how idiotic this system is - and, should they find you without a receipt, will simply ask you to get one for the next time. The rangers cannot sell you a pass, which, of course, would be far more convenient than having to wait a full day in La Paz. The system is laughably inept. Continue up the trail until "topping out" at around 5,800 feet. The flora has changed from cacti to a scrub, manzanita and oak woodland - providing shade as one continues, now on the interior plateau, east towards your desired camp for the night. Reach the highest point in the trail, some 6,100 feet, about one-half mile after entering the flatter woodland plateau. At this point Andy and Bob decided to follow a faint path to the summit of "Forestal" (1,980+ meters = 6,496+ ft) with an antenna mast atop. Forestal having at least 300 feet of prominence (the saddle at 1,880- meters), they secured another Colorado-rule summit. Disinterested, I slept for an hour. Andy returned alone, Bob having lost his way in the effort to reach some additional highpoint. With shouts of "YO!" ever-receeding into the distance, Andy kept track of me while sounding-off for Bob's sake. Bob returned with Andy and we continued to the "first meadow", some 5,900 feet (note the 200 foot drop), where we set up camp. We arrived at 2:30 p.m. - ten hours as predicted by Bob. Of course that prediction did not include an unanticipated summit. A person in good shape can make the backpack in eight hours, without, of course, the Forestal summit detour and the often protracted breaks that were taken enroute. Strange and unusual plant species intermingled with bizarre rock formations near our camp site. I enjoyed the afternoon exploring the immediate area before retiring for the night. We awoke to forty degree temperatures and were eastbound along the main trail around sunrise - 5:53 a.m. by our watches set to Pacific time. We walked past the ranger cabin in the main meadow ("second meadow") - "Puede usted venderme un pass?" ("Can you sell me a Park pass?"). We knew the answer already, but asked the question anyways to demonstrate our willingness to cooperate. and Baja Sur state highpoint. A bushwhack ensued, generally east by southeast, to the trail-free summit of the Sierra Laguna Range. 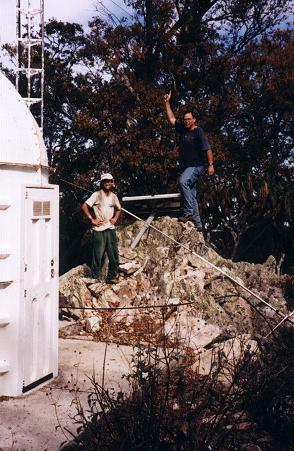 At this, the highest point of Baja Sur, was a large tank, a fallen antenna, a view unbefitting a 6,200 foot prominence summit, and no register. We congratulated one another, took photographs, ate lunch. A summit register was fashioned from a quickly-emptied can of Manischewitz kosher-for-Passover macaroons. Sometimes sacrifices must be made for the greater good. I also donated my pencil. For paper, Andy provided his ubiquitous list of Baja's 2,000+ foot prominence peaks. Andy seems to have these prominence lists in endless supply. Some guidebooks refer to the range highpoint as Las Casitas. The Park rangers referred to it as San Antonio. I do not believe either is an offical designation. I returned to camp after exactly five hours. This is our estimate for the duration of a typical ascent of the range highpoint from a high camp in the smaller, first (i.e. western) meadow. found on the large meadow. Bob expressed his intention to hike the well-beaten trail to Picacho La Laguna, the lower but more spectacularly situated peak located one hour's walk northwest. He wanted to leave in ten minutes. I said I'd come along if we left in an hour - enough time to rest a bit and enjoy some tomato soup with challah - Jewish egg bread. Andy purified water and napped a bit. The trail was quite well defined. Foregoing my usual bulky daypack by carrying only food and water, I forged ahead and reached the highest point after 48 minutes. Fifteen minutes later Andy and Bob passed me by, heading farther to an overlook, at least one forty meter contour lower, at trail's end. At the overlook was a register book with many Spanish entries. Entries only went back a year or two. A candle-adorned small shrine was at hand, one candle having burnt up a fourth of the register. 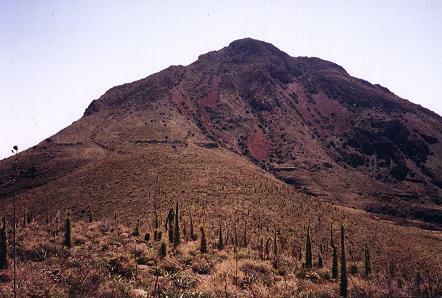 It is emphasized that this more northerly overlook is not the true summit of Picacho La Laguna. For one hour fifteen minutes I wondered at both the Pacific Ocean and the Sea of Cortez. A silly bee kept attacking my boots every five minutes, disappeared to inspect some flowers, and then returned to harass me once again. I would rather have had a cold and juicy fruit than my Israeli sausage with black bean tortilla chips: JUST TOO WARM. Back at camp an hour later we lounged around, had our suppers, and crawled into sleeping bags for the night. Andy and I shared a green two-man tent, while Bob slept in his bivy sack owing to the relatively mild night temperatures. The trek downhill lasted about five hours, as I had predicted. We had departed at 5:08 a.m. and made excellent time, going past the 4,600 foot saddle after 1 hour 20 minutes, and were at the 850 meter watering hole after about 2 hours 30 minutes elapsed. Upon reaching the roadbed at trail's end, we headed for the camper at our own respective paces. Wanting to reach shade sooner than later, I set a fast pace and was back at 9:45 a.m. Bob and Andy followed within ten minutes. Shifting around gear, a cursory cleaning with the wash basin, and a Yo Plait cherry yogurt followed. We drove within an hour. It is eight miles from the car camp to the large, so-called "second" meadow that once contained Lago Laguna. It is a mile less, seven miles, to the western, "first" meadow. The air distance from our high camp at the first meadow to the range highpoint is some five kilometers. Lord knows how far is was on-foot given that we bushwhacked to-and-fro. The total elevation gain for the climb to high camp (i.e. without any side-trip to climb Forestal) is calculated as (6,100 feet - 1,650 feet) + 300 feet = 4,750 feet, the 300 feet as the losses in elevation on proceeding downhill to the main stream at 850 meters (as 200 feet + two 50 foot drops). The total elevation gain for the bushwhack from high camp to the range highpoint and back is calculated as (6,850 feet - 5,700 feet) + 200 feet on return = 1,350 feet. Here, the 5,700 foot figure arises as the lowpoint of the climb at the second meadow, while the 200 foot figure arises as the gain on return from the second meadow to our camp at 5,900 feet. The total elevation gain for the hike from our high camp to scenic Picacho La Laguna is calculated as (6,500 feet - 5,900 feet) + (2 x 200 feet) = 1,000 feet. Here, the 200 foot figure arises as the elevation losses on proceeding from our camp at the second meadow (near the main trail / Pichacho La Laguna trail junction) to the summit of Picacho La Laguna. The total elevation gain on return the final day is calculated as 300 feet + (6,100 feet - 5,900 feet), some 500 feet. Here, the 300 foot figure arises as the gains in elevation after passing the main stream at 850 meters. Note the 200 foot elevation gain in proceeding the first mile west of high camp (at the second meadow) to the main trail high point at 6,100 feet. Given the above figures, an ascent of the Sierra La Laguna Range highpoint from the west entails a total elevation gain of 4,750 + 1,350 + 500 = 6,600 feet. A side-trip to reach the summit of scenic Picacho La Laguna, as I did with Bob and Andy, raises the total to 7,600 feet. Since Bob and Andy added Forestal and went to the very end of the Picacho La Laguna trail, their elevation gains were just over 8,000 feet apiece. The net elevation gain for this western approach to the range highpoint is some 5,200 feet, as the elevation difference between the lowest and highest points on the route. The former is 500 meters elevation (1,650 feet), as located along the dirt road leading to La Burerra. The latter, of course, is the range highpoint itself (6,824+ feet). We stopped in Todos Santos for fuel, ice for Bob's refridgerator, a telephone call to my mother, and, of course, a pint of ice cream for myself with the appropriate mix-ins. Bob and Andy had their customary lunches - generally sandwich material (Bob: luncheon meat; Andy: sardines) with beverage and dessert. We had contemplated a sit-down, restaurant meal on the trip. Since we passed through Loreto at dinnertime, that night seemed optimal. In contrast we might be passing through Ensenada, another seaside community, mid-morning ... hardly the time to be eating a seafood meal! I selected El Taste where we enjoyed tortillas with both fresh salsa and a wonderful, piquante, yellow shrimp sauce. Andy had water, Bob had lemonade, I had a strawberry margarita that proved more intoxicating than planned. For the main event, Andy and Bob enjoyed fish platters with rice timbales and vegetables. I enjoyed a "lobster casserole", in reality a seafood stew mainly of shrimp with hints of lobster, yet spicy with salsa roja ("red sauce"), and all inside a five or six inch-wide crockpot. Topped with melted cheese, it was almost too spicy. I wrapped the seafood in corn tortillas as a type of sandwich. The establishment was trying to ply its enormous steaks. In fact, when I made reservations as Bob and Andy filled up the gas tank, the boy waiter pushed plated steaks in front of me as a sort of lure into eating there. However we had visions of seafood. We camped about fifteen miles north of town, not far from the beach. Still groggy, I fell asleep almost immediately. Big driving day northbound. More than five hundred miles were put on the vehicle. We camped at exactly the same place as the first night in Baja, just south of Camalú, and within a few hours drive from Ensenada. Bob cooked spaghetti and hot dogs, along with green beans, for himself and Andy. I enjoyed Bob's leftover pierogies with my Israeli smoked turkey sausage, plus a chayote - the green vegetable akin to a winter squash. The chayote was best eaten raw with honey! Bob awoke at 5 a.m. and we drove by six. I slept in the camper all the way until the border crossing at around ten o'clock. At that point I switched with Andy and directed Bob to my home. We parted ways after a few telephone calls and exchange of food (I gave Bob kosher liverwurst and two individual-sized frozen pizzas). I had 270 e-mail messages awaiting me, mostly spam. Bob and Andy returned to Gila Bend around 6 p.m. Mountain Standard Time, with Andy's wife prepared to return him home. 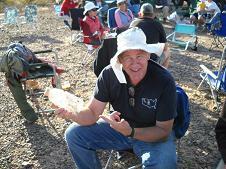 Bob camped that night at the same location as on the outbound leg, off Exit 236 on I-17 a little north of Phoenix. Bob returned to Flagstaff by 8 a.m., with plenty of time to "take care of chores" prior to his evening music practice for a future performance. I would vote for January. However, in a more normal year March may very well be preferred. The exception is climbing Picacho del Diablo due to its higher elevations. For it, the climb in May 2002 with Edward Earl featured acceptable temperatures. Beware of the driving. Highway 1 is slower than one is used to stateside, and certainly is more dangerous to travel upon - especially at night. Bees. We encountered bees on almost every climb. Enough said. Cholla and other nasty cacti. They stick to you and are difficult to extract. Despite these considerations, "Bob's Baja Boot Camp" was a valuable and rewarding experience. In February 2009 Mark Adrian, Edward Earl and Richard Carey traveled to Baja for the same two ultra prominence peaks. While on Tres Virgenes they located and retrieved Andy Martin's water bottle after sitting "in the middle of nowhere" for 5 years! 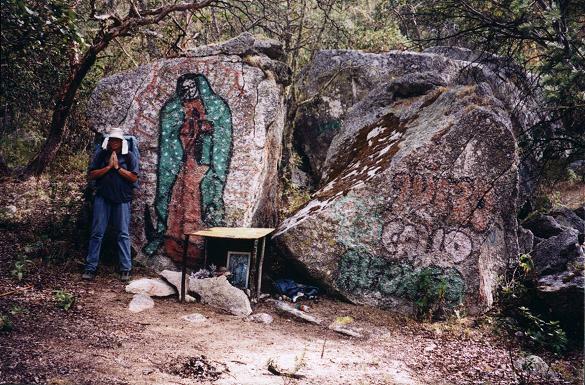 In addition, the 2009 trip members retrieved for me a bottle of air from the "painted Guadalupe Rock" near a small meadow at their Sierra Laguna campsite. This air now complements the air I saved from Bolivia's Chacaltaya summit back in 1994. Edward holds Andy's water bottle in 2009. "When we found the bottle, it was slightly more than half full. The picture that Adam added to his trip report shows exactly how we found it. Since the water in it has nostalgic value, we made every effort to keep as much water in it as possible. Since the cap was cracked, the bottle would have to be kept upright. I put it in one of the bottle holders on my pack, which keeps it in an upright position as long as the pack is upright; however, there were a couple of times when I put the pack down on the ground and it tipped over, and it leaked some water. There were also a couple of times when I had to lean forward to clear some branches while bushwhacking, and this leaked more water. By the time we finished our descent of Tres Virgines, only about half the water that was in the bottle when we found it still remained. We stashed the bottle in a space by the spare tire where it fit very nicely and stayed upright for the rest of the drive. There was no further discernible loss by the end of the trip. If it was empty by the time Mark returned it to Andy, it was probably because Mark's vehicle had no place to put it that was as safe as the space we found in our Baja rental SUV. I doubt that Mark simply neglected it completely: I made it very clear to all from the beginning that this water has nostalgic value. If the empty bottle disappeared from inside Andy's house, perhaps it fell victim to a overzealous housekeeper..."
after its return by Mark Adrian. So ends the water bottle saga. However not quite: perhaps through the hydrological cycle and the miracle of photosynthesis some atoms of the missing water will once again find a home at Tres Virgenes, its flora - and Andy Martin.